This week’s rock review features Mustard Jasper! 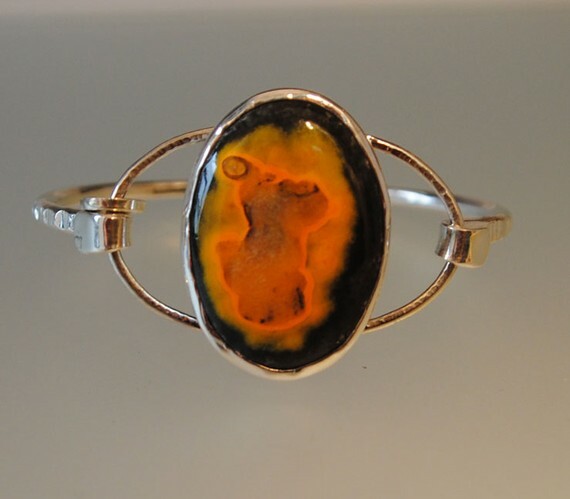 The name jasper is derived from old French word “jaspre” for spotted stone. Mustard Jasper is somewhat uncommon as it is currently mined only in Indonesia from the top of an active volcano, making it a special find! It often is black or gray on the outer layers progressing to a rich mustard yellow on its inner layers. Jasper is formed from Silica and volcanic ash that are deposited and consolidated in the presence of heat and water over time. Patterns are created as sediments are layered and then compressed. All Jaspers are a form of Chalcedony. Jasper is between a 6.5-7 on Moh’s scale of hardness. It is opaque and able to take a high polish making it a good choice for cabochon style jewelry. Jaspers are one of the birthstones listed for the sign star sign Virgo. 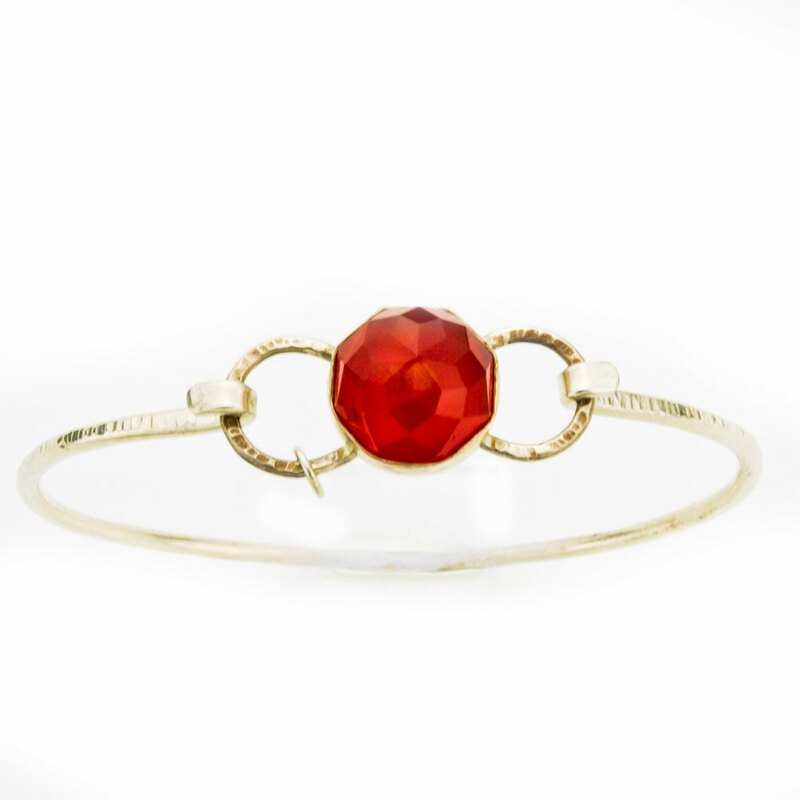 It is also the Mystical birthstone for those born in the month of October. Yellow Jaspers are thought to be associated with balancing and strengthening ones social standing. They also are used to give protection during travel and as a shield from negativity.Ancient European cultures used Jasper ceremonially to conjure rain. Legends say that Jasper drives away evil spirits and protects against snake and spider bites. Since Halloween is just around the corner, it might be just the right time to add jasper to your wardrobe! Mustard Jasper Saturn Bracelet from Layne Designs, available for purchase! 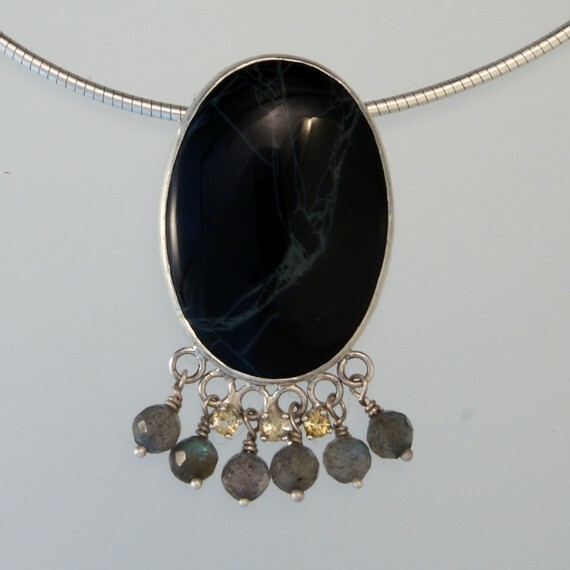 When you are a jewelry artist, it’s easy to sometimes develop a pattern of stone + metal = jewelry. This combination, of course, has exponential creative potential for any number of designs. However, it’s still important, as an artist, to challenge one’s self to think outside the box. One reason that Layne Designs works primarily in these two staple materials of the jewelry trade is to ensure that we are creating durable jewelry that will last for generations. Sometimes we find an interesting new material to use that lives up to our criteria. On recent trips to the beach, Layne and I discovered some fabulous shells that were just destined for a second life as jewelry objects. I visited the Outer Banks of North Carolina shortly after the hurricane. One of the only nice outcomes of a tropical storm is the abundance of ocean oddities that are readily available on shore soon after. I was astounded by the piles of shells that washed up all week long at low and high tide on Kill Devil Hills Beach. A whole section of the beach was literally covered with broken bits of sea polished shells. I was lucky enough to come away with some great finds. Layne visited Ocean City Maryland. On her trip she found tiny sand dollars, and shell slices. We’ve been inspired to think about ways to incorporate some of these pieces into Layne Designs Jewelry. A few of our new Saturn Bracelet toppers have seashell accents. We’re hoping to experiment soon with some new looks in pendants as well. 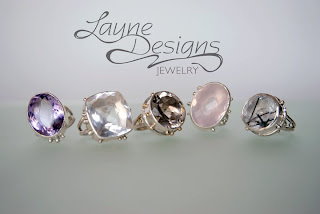 Visit the Layne Designs website in the coming weeks to see where creativity takes us! Check out these cute seashell accented mini Saturn Bracelets below by Layne Designs! All hail the Sapphire, gem of royalty and birthstone to all those born in September! Sapphire is a part of the Corundum mineral family. When thinking of Sapphire, most people think of the lovely deep cobalt color that is the “classic” color for this gem. However, Sapphires actually occur in many colors including pink, yellow, purple, orange and green. When Corundum is crimson, we call that a Ruby. They are a hearty nine on Moh’s scale of hardness and have a vitreous, or glassy, luster. 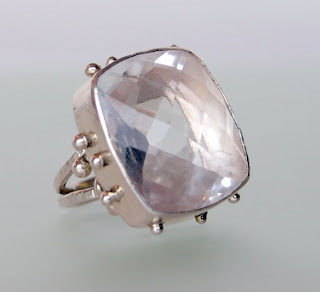 This makes this gem ideal as a faceted stone. Sapphires that fetch the highest price due to their desirability are deep blue in hue with up to 15% violet blue saturation. Many Sapphires have become famous throughout the years. One of these is the 423 carat Logan Sapphire, currently on display at the Museum of Natural History in Washington DC. It is a flawless specimen, hailing from Sri Lanka. Several notable specimens of Star Sapphire, Sapphire that naturally exhibits a reflective star shape known as asterism, are also on display at several museums. 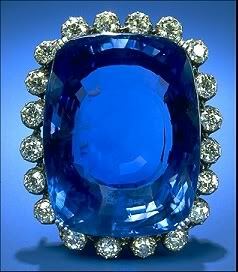 The Black Star of Queenland, discovered in Australia in the 1930s, is the largest sapphire known to exist. The Star of India, weighing in at 563 carats, is on display at the American Museum of National History in New York City. It was donated by famous robber baron J.P. Morgan in 1900 and has even survived a jewel theft! Thankfully it was recovered and returned to the museum for everyone to enjoy. The Star of Bombay, originally owned by silent film actress Mary Pickford, is also on display at the Smithsonian Museum of Natural History in Washington DC. Long before William and Kate, Sapphires were used as the focal stone in engagement rings of royalty for hundreds of years. The tradition of Sapphires as engagement rings dates back to medieval times when they were worn as a physical symbol of faithfulness, honor and commitment of the betrothed during the engagement period. Considering popping the question? Think about a sapphire instead of a diamond to tell a bride to be that she’s your princess! Today’s Rock Review features, the classic Obsidian! Obsidian is a volcanic glass which occurs naturally, making it an igneous rock. Obsidian forms when lava containing the minerals Feldspar and Silica cools too quickly for large crystal formations to crop up. This process leaves Obsidian with its trademark smooth glassy surfaces. It can be found in lava beds and usually ranges in color from smoky gray to deep jet black. The presence of other minerals, such as Iron or Magnesium can sometimes give the gem a reddish or green cast. A special kind of Obsidian called Snowflake Obsidian can occasionally be found when white crystals inclusions exist, creating a white fractal pattern. When bubbles are trapped in Obsidian, they can leave a golden or iridescent hue in the stone as well producing what gemologist call Rainbow Obsidian. A rare form of weathered Obsidian with a gray opaque band called Apache Tears can also be found on the San Carlos Indian reservation in Arizona. Who knew one gem could have some many different looks! People have been making good use of Obsidian since the caveman days, when early cultures used stone fragments for arrow and spear tips and other tools because of its naturally sharp angles when fractured. Greeks and Aztecs also used it as a primitive mirror. Today, we still use Obsidian as a cutting tool on surgical blades since it’s able to cut to a near molecular thinness and has a flat non jagged edge, even under an electron microscope. Thankfully for those in jewelry business, people somewhere along the way found Obsidian to be ideal for adornment as well as utilitarian purposes. It makes a great beads as well as lovely cabochons. Many wearers enjoy the benefits of its metaphysical properties which include guarding against depression and sharpening insight. Jewelry lovers who own Obsidian pieces should keep in mind that although the gem is sturdy, it is essentially glass, and therefore needs should be protected from blows that could lead to cracks and scratches and chips. Never clean this gem in an ultrasonic, steam cleaner or chemically based jewelry cleaning solutions. For care and maintenance, a rinse in warm water and polish with a soft cloth will do the trick. One hot new trend popping up all over the web and retail stores this fall is focal stone cocktail ring. They have also made an appearance this year on the hands of plenty of celebrities like Glee’s Lea Michelle and Mad Men’s Christina Hendricks. Both these actresses and many others showed off their rocks at award ceremonies this year, and now the trend seems to be catching on off the red carpet as well. 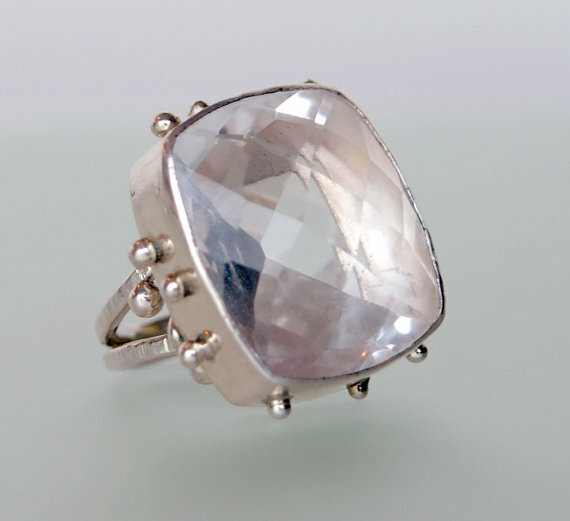 The focal stone cocktail ring features a large cut stone of usually five or more carats that is often surrounded by a decorative design or tiny accent stones. 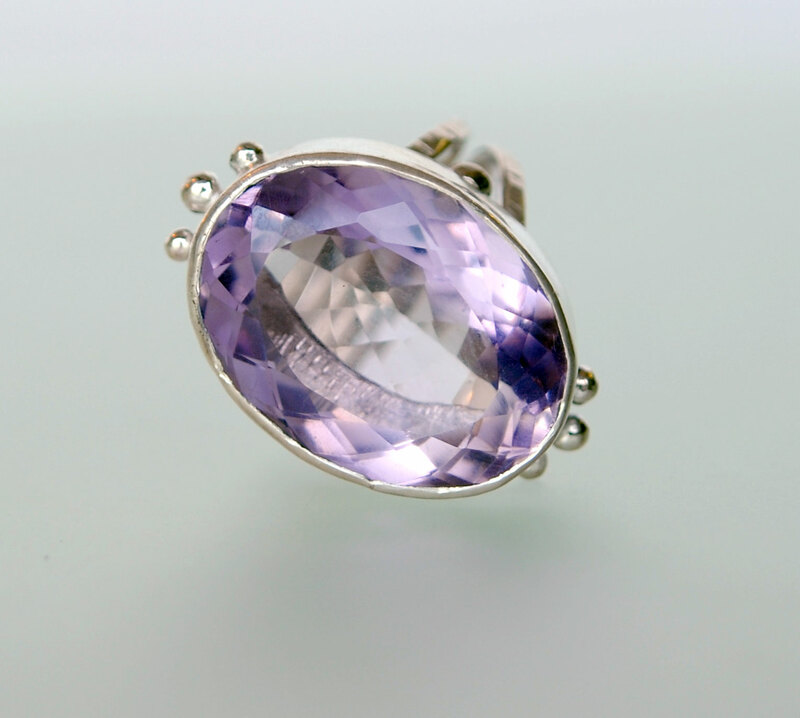 Some popular gems for this style are both lavender and green Amethyst, Citrine, Topaz, and many colors of Quartz such as lemon, smoky and rose. The Gems are almost always faceted.A few favorite cuts for this style are round and cushion cuts. To wear this trend best, choose a stone that really speaks to you and will compliment your day to day activities. Don’t worry too much about coordinating with your wardrobe. Contrasting your outfit will actually allow your ring to be the superstar of your look. If you must match something, think instead about complimenting your own physical features. Do you have green eyes? Green Amethyst will bring attention to their lovely shade just about any time you raise your hand to your head or shoulders. Are you a brunette? A deep brown Topaz will highlight your glossy locks. For those looking for a versatile ring, colorless Quartz would be an ideal “one size fits all” choice for any activity, outfit or occasion. Also, dare to move away from the ring finger. In photos, you’ll see this look being worn just as often on the index and middle finger as it is on the faithful fourth. Changing the finger that you wear this style on will add visual interest to your look and also let you keep on wearing sentimental or wedding jewelry in their normal place on your hand. Keep in mind you may need buy a size or two larger from your normal ring size when shopping for middle and index fingers. Check out these fabulous cocktail rings by Layne Designs to help you get in style this fall. Do You Have Problems with Argentium Silver? About a year ago, I decided to try to convert my silver stock into Argentium silver. 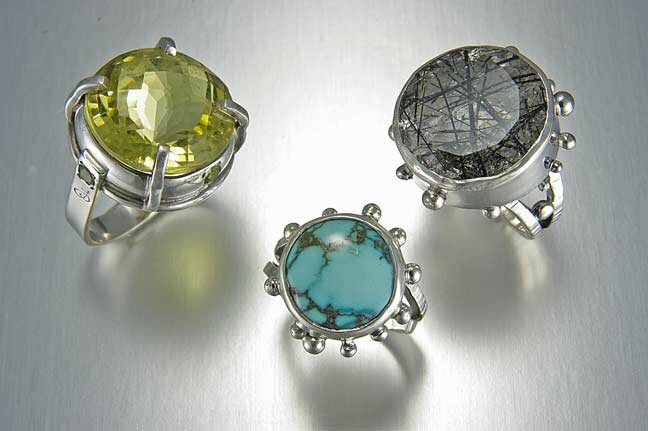 Argentium is a patented alloy of silver that includes some germanium for the purpose of reducing the tendency to tarnish. While the alloy is available in wire and sheet metal, it was utterly unavailable in any kind of special shaped wire, like half round for ring shanks, or the strip that I often use for bezels. Findings were limited, but available, and chain was scarce. 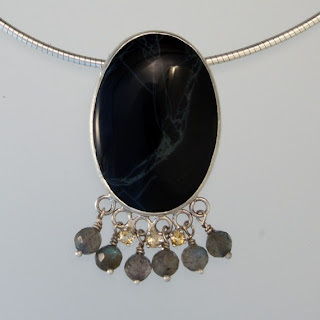 In dealing with sourcing problems, I found that I could use the argentum for sheet and wire, and get most of a piece made that way, but when it came to using the proper findings and chains, I had to use some traditional sterling. I did as much research as I could on this new alloy, but even though it has been around for at least 5 years, I could not find a single review of the material from a person using it. There was no information from a first hand account about how malleable it was, if it was easily scratched, or if it took a polish well. The only information available was put out by the manufacturers, and generally referred to different temperatures to be used when casting Argentium silver. In order to offer my customers this tarnish resistant option, I continued to use Argentiumas much as I could in the past year, dispite the fact that it costs more and had to be mixed with traditional silver at times. For all the jewelers out there who are interested in this alloy, I am writing this to help you make decisions about this alloy, as there was nothing available for me. The biggest problem I have had is that this metal becomes extremely brittle when heated, and breaks under the slightest pressure when hot. For the first time in 10 years, I dropped a red hot piece of metal in my lap because I was holding it in the air to heat the piece from underneath. At a certain temperature, the corner that I was holding from broke right off, and the piece bounced into my lap. The hole in my apron doesn't bother me. What does bother me, are the cracks that I have to repair every time I push down a bezel that didn't quite complete it's seam--the sheet underneath it cracks. I have had to scrap countless jump rings because if they are heated even slightly, the pressure of holding them in tweezers breaks them in half. I gave up on locking tweezers long ago for these...I'm talking about the delicate touch of just holding the ring in tweezers....the ring breaks before annealing temperature! Has anyone else been using a low-tarnish silver? What experiences are you having? Anyone who has experience with tarnish resistant silver alloys, please join the discussion. With the metal market on the rise, silver is taking a new place in the realm of precious metals. What do you think about tarnish resistant alloys? In today’s rock review, we discover Carnelian. It’s perfect gem to usher in fall in hues, or orange red and brown. Carnelian is a rust colored mineral that is often used as a semi-precious gemstone in jewelry and decorative art. It is a type Chalcedony that derives its color from the presence of iron and can range from pale orange to nearly black. It is between a 6-7 on Moh’s scale of hardness, has a vitreous luster and is translucent. 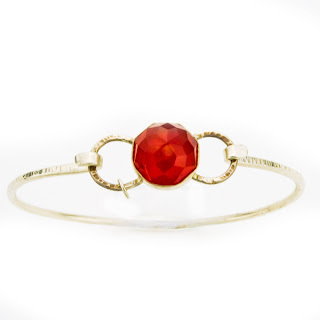 Sard is the name of a slightly harder and darker version of Carnelian, however, the names are used interchangeably at times since there is such little variance between the two gems. 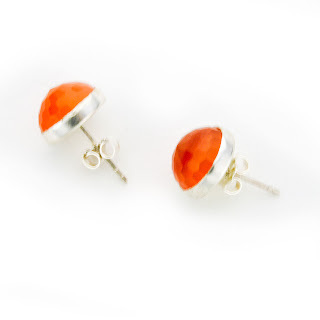 Carnelian can be found often in ancient cultures like the Phoenicians, Romans, Greeks, Syrians, Hebrews and Egyptians. It was a favorite for creating official seals and signet rings. The stone could be carved with relief style symbols, crests and seals that represented a person or government. The gem was either then set into a ring or fixed onto a cylinder and used to press warmed wax leaving a one of a kind mark on letters and documents to make them official. The Phoenicians also used Carnelian to create unique scarabs used in amulets, decoration or ceremony. It is also the gem that was in the first position on the breastplate of the Hebrew High Priest. Carnelian is said to have a number of metaphysical properties that can be imparted to a wearer including enhanced clarity and perception, sharpened concentration and protection from negative emotions. Finally, enjoy this poem written by Johann Wolfgang von Goethe about the lovely Carnelian’s history and properties. Will move to love and doughty need. Sweet hope and comfort in her pains".